Kylie never expected to be stuck on a tour bus with a pampered princess and her boyfriend's ex. Trace thought he was finally getting to do things his way. Until the label added co-headliner Gretchen Gibson, the only person in country music with more issues than him, to his No Apologies tour. Surrounded by tabloid rumors and people they can't trust, Kylie and Trace need each other more than ever. But the choices they make will change everything. Another wonderful read from Caisey Quinn about Kylie Ryans. 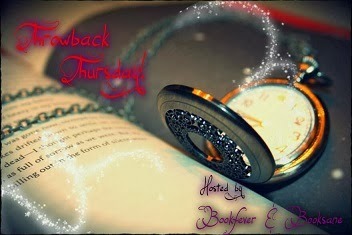 Throwback Thursday is a bookish meme hosted every two weeks by me and Stephanie @Bookfever where we feature books that we've read in the past but are still crazy about. It could be a book you read as a child and still remember and love or maybe just a book that you haven't read in a long time and want to show your love for.Each week we'll be featuring a new random question to answer! First one I won in a giveaway over at Bookfever. At first I was staling to get this because I was trying to win it like I've won the previous two, but couldn't take it anymore so now I had to get it so I can continue the series. She’s too young for him. He’s too good for her. She seduces him away from the gentleman he tries to be. He leads her to her own hopes and dreams. to be the best person he can be. This is the third book in the Mates, Dates series, which features Nesta, a confident and fearless girl with model looks, charisma and charm. Despite all this, Nesta feels out of her depth when she meets the wealthy Jason. So, again a book I have in danish and I'm not lucky enough for there to be any quotes on goodreads or the synopsis of the book. What was your latest 5 star book? Review: "The Boy Who Sneaks in My Bedroom Window"